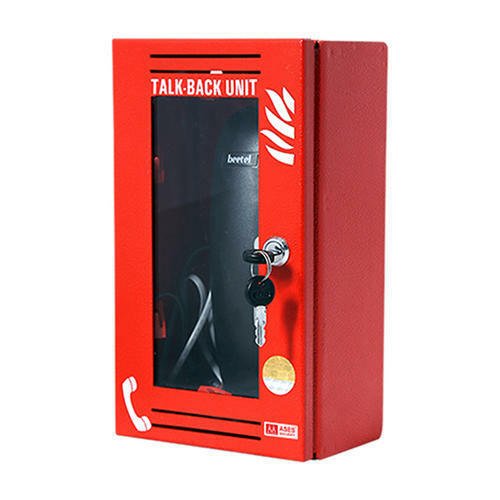 Fire man telephone handset is a portable unit used to communicate with central station. Insertion of handset inside the jack , send signal at control station. SECURITY handset offers a hands free communication. Handset is kept inside a metal box protected with locks key . Master to unit & unit to unit both communication is possible . Unit to unit communication is possible the keypad of the handset. Incepted in the year 1995, at Delhi, (India), we, “ASES Security Private Limited”, are an ISO 9001: 2015 Certified Company, engaged in manufacturing and supplying a premium quality range of Customize Panels, Repeater Panels, Digitally Addressable Panels, Manual Call Points, Fire Alarm Hooters, Response Indicators, etc. Quality attributes such as longer service life, reliable performance, low noise & maintenance levels, energy efficiency and easy installation make these products widely demanded in the market. Moreover, we make sure to employ the most sophisticated facilities for carrying out production related activities in the most efficient and effective manner. In addition to this, our state-of-the-art infrastructure is outfitted with advanced fabrication machines and cutting-edge technology that aids us in offering best-in-class range of products in the market. To ensure that our offered products are in-line with established quality standards of the business, we have a tendency to manufacture these by creating use of the high grade material sourced from the trustworthy vendors.